Durability and its environmental impact is an important factor when considering the use of a building material. Autoclaved Aerated Concrete is proven to be a very durable material. LeichtBric AAC will not rot,warp,rust,corrode,or otherwise decompose. LeichtBric AAC provides a very low maintenance , cost and time, saving solution for your building consideration. LeichtBric AAC has exceptional thermal insulating qualities. Buildings constructed with LeichtBric AAC tend to be cooler in summer and at the same time you can enjoy energy and cost savings on electricity. LeichtBric AAC is an inorganic material that does not burn. The melting point of Autoclaved Aerated Concrete is over 1000ºC, more than twice the typical temperature in a building fire of 450ºC. 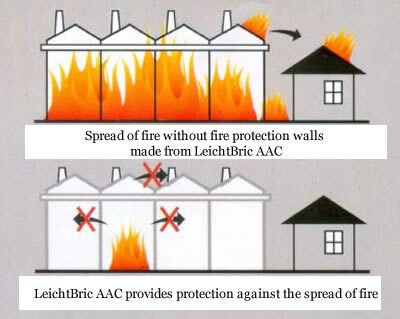 LeichtBric AAC is also mold resistance. The typical nutrient source for mold is moisture LeichtBric AAC is a breathable, concrete product made with clean, inorganic, materials and it does not offer the nutrients for mold growth. A commonly overlooked environmental problem is noise pollution. The solid wall construction of a building made of LeichtBric AAC provides exceptional acoustic insulation. Its porous structure and high surface mass, coupled with its ability to dampen mechanical vibration energy, greatly reduces outside environmental noise pollution and the indoor echo effect in empty room thus providing a quieter and more comfortable interior for the occupants. LeichtBric AAC is an inorganic, insect resistance, solid wall and construction material. It is impossible for insects and rodents to inhabit in them. LeichtBric AAC is an inorganic material that contains no toxic substance and does not decompose or release gas. Since Autoclaved Aerated Concrete is a structural and insulation material, it allows the elimination of other materials that may contribute to poor indoor air quality. LeichtBric AAC blocks are quickly and accurately cut with a band saw to the desired dimensions, and into accurate angles and other shapes. LeichtBric AAC can also be drilled,nailed, grooved,routed, shaped, sculpted, carved, coated, floated, screwed into and milled with common tools and finish with paints, tile, drywall, or veneer. Window trim , chases for plumbing, wiring and outlets and decorative features like keystones, window sills and column can easily be created on the job site. LeichtBric AAC simplifies construction by minimizing the number of different building products involved. Building owners may see a significant reduction of maintenance and energy costs as well as an increase in overall comfort and safety. 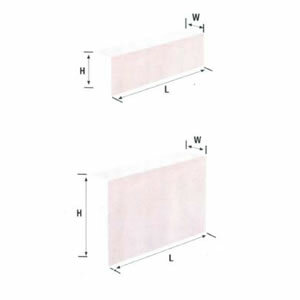 LeichtBric AAC has homogeneous and softer pores meaning LeichtBric AAC has more strength stability towards pressure. LeichtBric AAC Interlocking block type. Interlocking block is a new generations of AAC type. 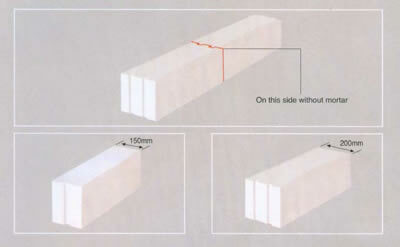 Interlocking block reduces the quantity of mortar used, increased the speed and installation on site. 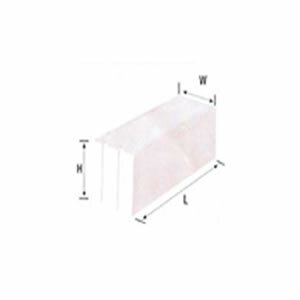 In comparison with competitors products LeichtBric AAC has a relatively lighter weight meaning LeichtBric AAC is more economical for structural cost especially for high rise building.